He was timid by nature and slept with His mother at night. Even as a small child He used to get up at midnight and repeat " Allah, Allah ". While playing with little children, He craved to see " Allah ", and felt sad when He could not. When He grew up a little, He was asked to take cattle for grazing. If He came across a good looking cow or calf, He felt that it might have seen Allah, so He went and bowed before it and asked to be directed towards Allah. He made similar requests of trees and bushes and wept bitterly when His requests were not fulfilled. As a child, Sainji was in the habit of dreaming often and often saw a Divine Being with a crown like a cap and once saw Him flying on horseback. When He was still a child, the area was effected by a severe drought and famine and many people died of starvation. With the grace of God, when Sainji went out with the cattle in the morning, He found two watermelons in a vine in the desert every day. These would suffice for food the entire day. No one else saw them, and this became Sainjis meal every day till the famine was over. When Sainji was about 16 years old, His relatives asked Him to go out for work and earn wages for the family. While other laborers got 25 paisa daily, He was given only 12 paisa because He was thin and could not carry the heavy weights. One day He was asked to take up a loaded basket and pass it on to the next man. Due to the heavy weight on His head, His whole body bent under the weight. Finding this very difficult, He felt that only Dastagir Badshah Pir could rescue Him and spare Him of this hard physical labor. So, He made it a habit to say " Come to my rescue, Oh Dastagir Badshah Pir " while carrying the heavy load and passing it to the next man. Soon, His request was granted and it started raining. Since it was winter and very cold, the work was stopped. He returned home and went to sleep. Early in the morning, He heard someone calling Him. " Come, Oh little Nasir Hallalani. Come, Oh little Nasir Jallalani ". He hot up and saw a boat coming along mirwah ( canal ), even though it was dry. He saw a Divine light stretching from Heaven to the boat. There were five Divine Souls and Dastagir Badshah Pir in the boat. He went running to meet them. All of them bestowed great affection on Him. Hazrat Mohammed Nabi Karim (PBUH) then entrusted Him to the care of Dastagir Badshah Pir who in return told Sainji " Hereafter I will be looking after you. You should get Divine Nam from Hazrat Abdul Sattar Shah of Dargah Jhok Sharif ". Sainji and His family were poor, and since there were no trains , the long distance involved in travelling to Jhok Sharif made it hard for Him to go there. Fortunately, a relative informed Sainji that Hazrat Abdul Sattar Shah was expected there that day. Sainji was delighted and accompanied His relative. Hazrat Abdul Sattar Shah arrived and sat under a tree called the " Holy Tree ", so named because the bark of this tree was used to treat anyone with a fever. Sainji went and bowed down before Him. Hazrat Abdul Sattar Shah took Sainji away from the gathering for privacy. He told Him that He had received the message from Hazrat Nabi Karim(PBUH), so He had come there only to give Him Nam. Sainji spent many years in the service of His Murshid Sahib at Dargah Jhok Sharif. All day his activities involved sweeping, washing utensils, milking cows and cleaning the stable of His Murshid’s mare. He sat in meditation practically all night. He spent a lot of time in the desert and the hills, continuously sitting in meditation for 10 days (daha), twenty one days ( ekihas ), and 40 nights ( chalihas ). He consumed four neem ( type of tree ) leaves and a little water in the morning and that was His food for the whole day. He once sat in meditation continuously for four chalihas. After such hard penance, He felt so light that He walked as if He was flying. His mother was worried and was sad at His absence. On completion of an ekiha, His Murshid Sahib’s soorat told Him that He should go home and console His mother. Once during a very hot summer, when the barks of trees were burnt from the heat, Sainji sat in meditation for forty nights in the desert without food and drink. He was said to have felt as if He was sitting on a very hot plate with a fire underneath. His body was covered with sand because of the desert winds. When the forty nights were up, His Murshid’s soorat came to ask Him to get up. As He got up, His ënafs’ ( ego), came out of Him and stood besides Him and requested Him in Allahs name to get Him a drink of water. He replied that there was no water in the desert. Nafs then said that the matka ( clay utensil ) in the Dargah nearby contained a little water and again asked this in the name of Allah. Sainji went to the matka, took out the water and finding it very dirty at the bottom, threw out the water. Nafs cried and exclaimed that He should not have thrown out the water and would have drunk the dirty water. Sainji started walking towards the hills. Being without food, drink and empty of nafs, He felt very light. He came to a hindu temple where there was a festival going on. The priest had some sweet chapattis and sugar balls before Him. Sainjis nafs again requested Him to take two chapattis in Allahs name. Sainji did not agree but the priest gave Sainji two chapattis and some sugar balls ( ladoos ). Sainji gave these with water to His nafs. After consuming these, Nafs became bold and teased Sainji by saying " See how I made you drink and eat". This enraged Sainji who decided to fast His entire life to teach His nafs a lesson. However, Sainjis Murshids soorat came and instructed Him not to do so. He was told not to remain in the hills His entire life, but to go to His place and spread the Sufi Divine faith.
" Aaryani Ayhan Na Ditho, Jeki Ditho Ho Moon ", with tears in His eyes. When Sainji was still very young, some people started teasing Him and He started to weep. His Murshid happened to see this and took Him in His lap and consoled Him with love like a father would. Sainji often said that His Murshid sahib was holding Him in His lap thereafter. Once someone commented to Sainji that He must have met so many other Divine souls. Sainji replied that He had always had His eyes on the moon and never looked at the stars ( referring to His Murshid ). Sainjis Murshid always told Him " God has given me two sons and you are the third son". He often told others that whatever spiritual experience Sainji had during meditation in one evening, others did not have after a year’s time. He instructed people not to bother Sainji with worldly affairs as He was busy with Nam all day. Once when Sainji got up from meditation at Roza Sharif, He saw His Murshid coming to Him with another person besides Him. His Murshid said to initiate the person and give him Nam. Sainji replied with great helplessness that He had not attained salvation Himself and He did not deem Himself capable of taking other people’s burden. After His Murshid persisted, Sainji initiated the person with tears in His eyes and said " By your order, I have initiated this man, but he is truly entrusted to Your care". Thereupon His Murshid Sahib took Sainji by His arm and came at the door of Hazrat Shah Shahid’s Roza and said " Oh, Sain Shah Shahid Sain, I have brought this child to your door. His murid’s are yours". Then, He took Sainji to chowkandi Sharif and said " Oh, Shah Qalander Data Pir, I have brought this child to your door. His murid’s are yours". Then He told Sainji to go on initiating people, entrusting them to Shah Shahid Sain and Shah Qalander Data Pir. After this, Sainji used to write in His letters to His murid’s " You are not my murid’s, but Theirs". Sainji always stood tall and the Divine Light shining in His eyes highlighted His appearance. He had a broad ësoonheri’ ( beard) with some black hair in the center. In His youth He wore green clothes. In His later years He wore a white long kurta and shalwar. He never wore a new shoe or a new coat.. 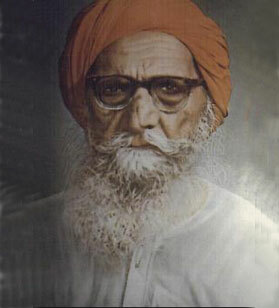 He wore a home made cap made from cotton in winter and a turban of saffron color when He went outside. He had a black ëkhathi’ (blanket) with Him with which He used to cover Himself while meditating. He walked with a simple wooden stick in His hand. He walked quite briskly and even people much younger in age had trouble keeping up with Him. He always sat with His back straight. His daily routine was very simple.. From midnight till about 8 a.m. and from 5.30 p.m. till sunset, He sat in meditation on the floor. He went to sleep fairly early in the evening.. When He was making rehan (discourse), His tone and manner of speech resembled a grandfather talking to his grandchildren. There was no pomp or show, no kalaams were sung and no book was read. He did not like to talk about worldly things but maintained a spiritual content. All during the day He was heard saying " Allah-e-Allah" or "Allah-Hoo". --This was compiled by the "Late Roopchand Kripalani"
speak as little as possible so as to utilize dams (breaths) with Nam. Avoid using alcoholic drinks. He never used even brandy. Be frugal. He did not like to waste money, food, water etc. He said to drink water slowly and while sitting. Be kind to all, even helpless tiny creatures like the ant. Never send back a needy and hungry person who comes to your door, even at an odd hour without giving them food or water. He said " look at the stomach of the person and not at his face". In November 1960, Sainjis urinary tract and asthma became problematic and He was brought to Karachi for treatment. He gave His four sons the necessary instructions before He left. He told Sain Gulab Alai ( the third son ), not to allow anyone to weep after His departure and not to allow any kalaams near His tomb, indicating to him the burial site. He told him to recite Quran Sharif near the tomb. On arriving in Karachi His medical problems worsened. He was transferred to a nursing home ( medical facility ), on the 14th of December, 1960. He underwent a prostate operation on the morning of the 15th. He woke up at midnight and asked what time it was. He wanted to get up for meditation, but was told it still early. He remarked that half the night had already passed. He told someone nearby " If you allow me to sit up, I will bless you". When the nurses insisted that He could not sit up, He remarked " What will my Murshid Sahib say ?. I cannot sleep after midnight". He woke up on the morning of the 16th and spoke cheerfully to all present. He embraced Sain Mohammed Waris ( His Murshid’s grandson ), who was returning to Jhok Sharif to attend the anniversary of Shah Qalander Data Pir. Sainji said that it was indeed a sacred day and that He would be going there soon. Soon after this, He lost consciousness, developed a high fever to 106 degrees F. He breathed His last at 10 p.m. on the 16th of December, 1960 while Mela rag was going on at Dargah Jhok Sharif. Hazrat Abdul Sattar Shah, who was Gadi Nashin exclaimed that "Fakir Sahib" had arrived there ( in spirit ). He was brought home and given a bath while Quran Sharif was being recited. At 5 a.m. His body was taken with great dignity to Jalalani Sharif where people from all around the area had gathered to get the last darshan of Sainji. Before sunset, His holy body was laid to rest.